Artistic Artifacts Store Hours: Tuesday - Saturday, 10:00 am to 5:00 pm (Thursdays to 6:00 pm). Visit our calendar for details on special event or holiday hours/closings. Artistic Artifacts is the source for the latest “Creative Finds for Creative Minds.” No matter your medium, you’ll find products and techniques to use in sewing, and a full range of fiber arts and mixed media. Shop for yourself, or set up an Artistic Artifacts wish list so your friends and family can shop for you! We are an authorized BERNINA USA dealer and also the location of the only WonderFil™ Threaducation Center on the East Coast. Artistic Artifacts is one of 10 shops featured in Quilt Sampler® Spring/Summer 2018! Purchase your choice of kit to complete our magazine-exclusive Batik Panel Quilt project! The magazine is on newsstands now— or purchase your issue from us. Our own line of Artistic Artifacts Fluid Textile Paint for fiber and mixed media work as well as other paints, mediums and tools. Painter’s Threads by Tentakulum, handpainted and space dyed textile materials created from silk, cotton, wool, rayon and metallics. 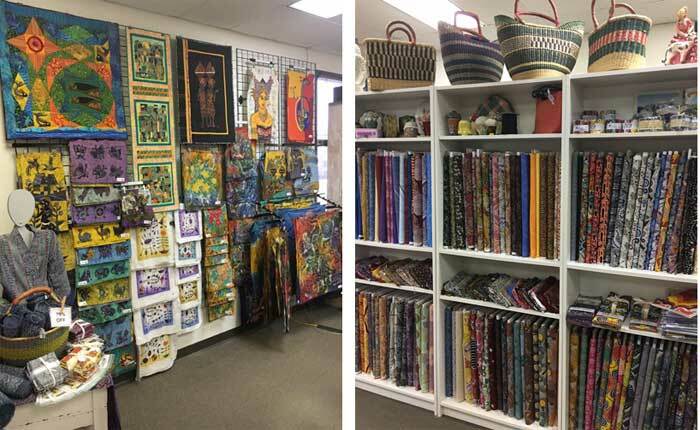 In addition, we offer a large range of mixed media supplies; vintage fabric, trims and ephemera and a wide variety of classes and meet ups, including monthly JAMs (Judy’s Altered Minds) & How Do I ... demos. Artistic Artifacts is a member of TAFA: The Textile and Fiber Art List. TAFA is a membership organization of artists and businesses rooted in textile and fiber art products and traditions. TAFA unites old and new traditions, their historical and modern importance, giving a shared platform to both contemporary and traditional textile techniques from all cultures. Our shop is located 4750 Eisenhower Avenue, Alexandria, VA and is open Tuesdays through Saturday, 10:00 a.m. to 5:00 p.m. (with extended hours until 8:00 pm on Thursdays) and from 12:00 noon to 4:00 pm on Sundays. Learn more about visiting Artistic Artifacts including complete directions, nearby accommodations and more. Judy Gula is the owner and Chief Creative Mind behind Artistic Artifacts. Read her Bio and schedule one of her lectures and/or workshops for your for your quilt guilds or art group. Read about our annual participation in The Row by Row Experience and The Wooly Block Adventure. Keep up to date on our current activities by subscribing to our weekly e-newsletter and following Judy’s Blog. View our calendar for up to date information and our events page to learn more about the national quilt shows and art events, including information about Art & Soul creative retreats, that Artistic Artistic travels to.